Periborg & The Electric Wang Show | OhGizmo! In an effort to get revenge by turning Americans into lazy gluttons, Eiji Morikawa has set out to Periborg everyone! 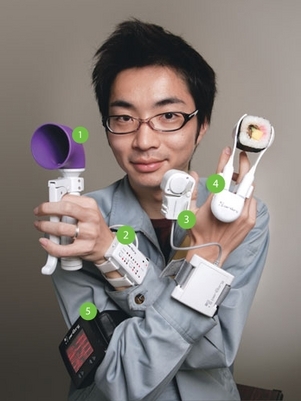 He?s a 28 year old electrical engineer that has designed a range of, well, stuff, for gamers. He calls the range Periborg – part peripheral, part cyborg. They are designed to make the gamer?s life easier. 1) Obacha-Break-an airhorn that will destroy an opponent’s hearing, rendering you the winner at anything with voice commands. 2)Cocolo-Con-a heart monitor that will let your parents tell whether or not your stinky, stinky corpse is alive or dead after a 86hour game-a-thon. 3) Ore Commander-[Already featured here. -Ed.] not pushing the A button fast enough in Track & Field? This baby will cyberize you to a 20 click per second rate. 4) Shock-C-this actually useful ditty will let you eat without leaving any grease on the controllers. 5) Electric-Wang Show-it conveys messages about your… ahem… status. Your, ehem, status of what? Your private parts? Don’t get it.